So, the baby gate is coming off the wall. This is a problem, as the Official Immigration Gate between Dog-ville, and Kitty Haven (which is made up of two neighborhoods, Mel-topia and Oo-land) must be operational at all times to prevent hostilities between the natives. Obvious solution: get more of those oak medallions, urethane them, and use them to attach the gate to the walls. Well, I got the medallions. Urethaned them (that stuff stinks to high heaven). They are outside drying in the sun as we speak, with several hours to go. And, lo, what do I see on the horizon? The maw of an angry beast of a storm. Dammit. Alpha child has been after us for riding lessons for years. We broke down a couple of years ago, got the helmet and boots. She lost the helmet, and we decided it was going to be a while before we tried again. She is so proud of herself (and well she should be). She payed attention to the horse and her instructor. She backed Chester up (right on cue). And then she insisted on helping out with the barn work afterwards. 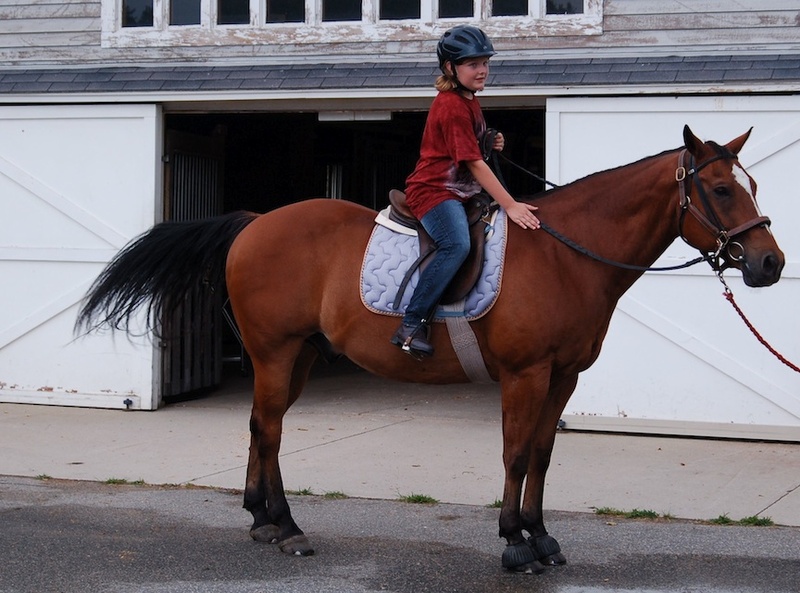 She got to help take off the saddle, bridle, brush him down, and then (wonder of wonders) CLEAN THE BRIDLE. Happiest kid on earth. Yup. Take a chunk of butter and some olive oil. Heat it up in a frying pan. Toss in a pile of minced garlic. Mix of around until its a little brown (careful – this stuff turns to sludge in seconds!). Toss in some shrimp (maybe a pound). Add some cilantro and lemon juice (not too much or the kids won’t eat it. I kept going until they started yelling at me to stop). Cook until the shrimp are pink. Serve over pasta. Bask in the glow of creating a dinner the stinkers will eat. Our country has plenty of good five-cent cigars, but the trouble is they charge fifteen cents for them. What this country needs is a good five cent ANYTHING! My computers are getting better at coordination. I had best keep them happy. Dad: Beta! Are you ready for Lacrosse? Beta: My dress is too tight! Its hard to get off! I was up all stinking night arguing with InDesign. The indexing feature is just a pitiful waste of code. Granted it was a 950 page book, with 4000 (plus or minus) index entries, but taking 35 seconds to remove a dash from an index entry? Really? 1. Please give the option to default the range settings to whatever was last used (Current Page, To Next Use of Style, etc). 2. Allow me to copy index entries, preferably groups of them, but even one at a time would be nice. I do not understand why this is not already possible. 3. How about an auto-fill feature in the heading fields while I’m dreaming? That would be super awesome. 4. What is up with the algorithm?!? 35 seconds to update a single entry? A full minute to delete 5 entries? That should have been 1 second, and 5 seconds, at most. I cannot conceive of the implementation that would give such horrible performance, no matter the size of the document. 5. Your tech support guys are wonderful. Give them raises. They couldn’t help me, but they really tried. Well, things have been crazy the last couple of days! Last Monday, we went to the Hampton Memorial Day Parade. Its funny that everyone comes back from everywhere to be at the parade. Saw people from high school. Saw people who babysat me. Saw people who were at the baby shower that was thrown for Mom two weeks after I was born (the last time I was early for anything). That afternoon, we went to the old house in Willimantic. I wanted to get some of the plants and bring them home with me. Weird to think that plants have sentimental value, but these did. The garden is in full bloom. Irises are everywhere. The evening primroses are thriving (they’ll bloom in a couple of weeks), and the day lilies are going gangbusters! I got a shovel full of both irises (they came from Mrs. Hardistay), an alium from Mrs. Holbrook, some poppies from the back, and some of the blanket flowers that Brownie loves. Thursday was Adele’s spring concert. She did great! The whole fourth grade sang for every song, so she was up there for 20 minutes. After that, Mom and I went out to lunch, and then to the Boston Museum of Science to see the Dead Sea Scrolls. The Dead Sea Scroll exhibit needs its own post. It was fantastic. They gave so much historical context, spent a great deal of time explaining the times when the scrolls were written, and the scrolls themselves are beautiful. The writing was so precise and tiny, the skill that went into them was just … yeah. There aren’t words. And then there was Friday. Friday, we sold the house in Willimantic. Sold. I cried walking around in it on Monday. But now it is just sweet relief to know that the burden of maintaining it is no longer ours. No more two mortgages. No more two sets of property taxes. We’ll actually be able to pay down the other debt, and start saving up for a new car/vacations/college/retirement. So yesterday, We went out and got clothes for me, sandals for Adele, a duster for the ceiling fans, and Quinn and I went to the Cheesecake Factory (yum!). Today, we’re going to the Christmas Tree Shoppes to get a table and chairs for the back deck, along with an umbrella. We’re also going to get a tent. The kids want to go camping. So a nice cheap tent will do nicely. And then we pay Mom back for the amazing loan she gave us, and we go back to being house-poor. There are worse things in the world. All in all, its been a fantastic week.